Smoked Fish was something which was not my taste initially, maybe because of its "raw" uncooked look.......but as I got used to seeing it everyday in the refrigerator (yeah, thats my husband's favourite and it gets into our shopping cart everytime we shop), somehow eventually developed a liking for it over the past 6 years...So when I came across this recipe in one of my cookbooks gifted by Umm Mymoonah when she visited me, I knew I was going to surprise my dear Hubby for his breakfast. The thin slices of Smoked Fish rolled along with the freshly prepared crepes and Cream Cheese leave a good taste in the mouth unlike the "only sweet" breakfasts ! 1. Sift the flour and add the milk and a pinch of salt. Mix well until smooth. 2. Beat the eggs and add to the milk-flour mixture. Set aside this batter for about 10 minutes. 3. In a non-stick pan, heat a tsp of butter. Add 1/4th of the batter and quickly rotate the pan to spread the batter to the sides. Cook for about 2 minutes, until the side facing the pan turns slightly golden brown. Flip the side and cook for a minute again. Remove from heat and set aside. 4. Repeat the process for the rest of the batter. 5. Make a smooth paste of the cream cheese with the double cream. Spice it a bit with pepper and salt. Add dill and combine everything well. 6. Spread a thin layer of this cream cheese paste over the prepared crepes. 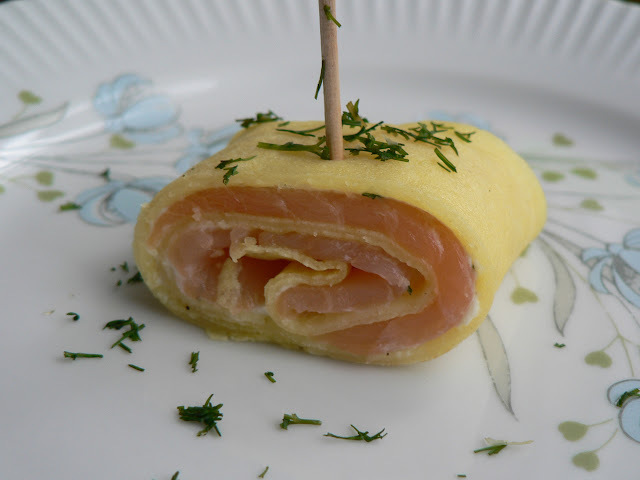 Layer it with the Salmon slices and then carefully roll the crepes like a swiss roll and cut into small slices of about 2 to 3 cms thickness. Hold the cut pieces individually using toothpicks. They are now ready to serve. Tastes best when eaten immediately. Simply cant take my eyes from ur click..delicious. Beautiful presentation !!! I am sure it tastes as good as it looks. Delicious recipe n awesome clicks too. I just made these now! Delicious!!!! what a great recipe!! !